These Cags Are Recommended For Sea Kayaking, Inland Kayak Touring & Open Canoeing. Sea kayakers and inland touring paddlers as a rule spend more time upright with their heads above water than white water kayakers. All day comfort and performance is the primary objective with these cags. Hence perhaps a full dry top with a tight, latex neck seal might be over doing it. The higher performing touring/sea kayaking cags will have latex wrist seals to prevent any water flushing or paddle drips inside the arms. However, when it comes to the neck things change. 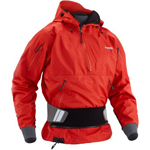 These jackets have the ability to be opened up, allowing them to vent if required and also are much less restrictive than a white water dry top. When conditions change or if the paddler is at rest, the hood can be put to good use, and the collar system can be closed up providing protection from the elements. The UK has a varied coastline, extensive canal network and many lakes, lochs and tarns. These jackets are perfect for exploring and spending time out on the water in comfort, whatever the weather. A lightweight, ventilated jacket available in ladies’ specific and also men’s sizes. Basic 2 layer cag, a good all-round paddling jacket. A very popular jacket from Palm, constructed from breathable 2.5 layer fabric with high end features and a removable hood. Palm Equipments top of the range sea kayaking jacket, containing all the features sought out by serious paddlers. The NRS Orion provides the ultimate protection from spray, wind and rogue waves. It features an articulated storm hood with face shield and a GlideSkin™ neoprene neck gasket. The High Tide has been designed as a comfortable all-round paddling jacket.